Some bread out of the oven cooling in the early morning sunshine. The one in the front is in reality very small but because of the way the camera works it looks quite big. Thanks to the kefir and whatever yeast (fungus) we use we have bread and can make our own as human beings have been doing for a very long time now. Fungi and bacteria work with the building blocks of the living world to create and destroy. The more we learn about how they work the more amazing they turn out to be. Maybe we should have a National Bacteria Day too? Here are some of this autumn’s crop of fungi photographs, taken at Westonbirt, Glos and in the Forest of Dean, which is on the other side of the Severn Bridge, but on this side of the border with Wales. It is a good year for fungi in the UK, so have a go at seeing what you can see, or go to an organized walk or a talk, lots around ! 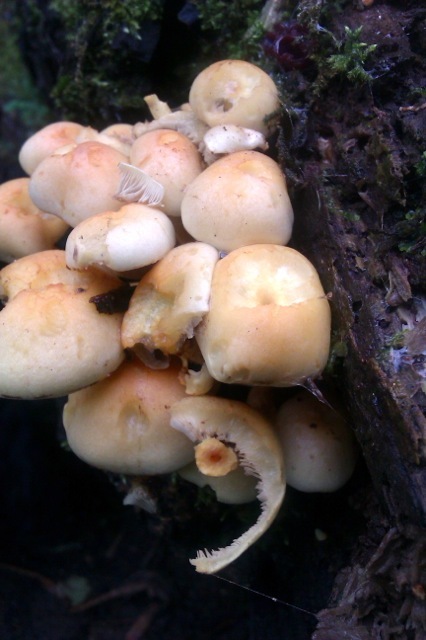 This is the first UK Fungus Day and I think it is a great idea! I have had a stab at identifying some of them but as ever warn people not to go by my identification as I am not a mycologist. I used to be quite reasonable at identifying about a dozen or so of the edible fungi, but as the years pass I have got out of practice. If you go on a fungi foray with a group or a self-styled forager be sure to ask them how they learnt their trade and ask lots of questions. In these straitened economic times, people turn to all sorts of ways to earn a living and foraging and ‘teaching’ foraging is one of them. For most of us, wild fungi are not an essential part of our diet, but rather a treat, a flavour, an aroma, something maybe that one wouldn’t desire if not driven by media hype and an urge for different experiences. I am not saying don’t or that it is wrong to want to taste and touch new things, just be extremely careful. There are cases of poisoning each year, usually well-documented in the press, of people who eat the wrong fungi, or the wrong berries or plants. What is fun and completely safe however, is to go out and take photographs and look for them. We are sticking to that this year unless we see the ones that I know I can id positively. And not to create any confusion, we didn’t bring any of the fungi depicted here home with us, only took their photos. Please do not ask me to identify your fungi finds! I am pretty sure this is the larch boletus, with its spongy underside. and I think this is Yellow Stagshorn( Calocera viscosa) – because it was growing on wood but it’s not one we see very often, it is very small and delicate but has this outstanding glowing colour. …and finally the most glamorous one we have seen this autumn which I think is a magpie inkcap but I haven’t found an image exactly like it so who knows? One of the hardest things is keeping the dogs out of the field of shot, as anything that interests us, interests them and we don’t want them to eat the fungi either! Anyone want to tango with a wet poodle? So for those of you who miss him, here is your small friend Zeb, following an exciting jump into a mud bath on the edge of a small pool which contained a stick of desire that he had to have, (just had to). We are taking him and his sister to the beach this coming week. I forsee many early evening baths. 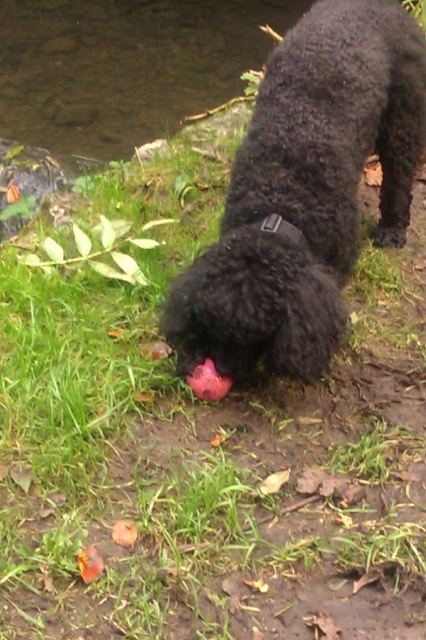 This entry was posted in Dog Walks, Out and About, Plant identification, Poodles, Pure Joy, Wild Food, Wildlife and tagged autumn, uk fungus day, wet dog on 13/10/2013 by Joanna. As you can see it is pretty wintry still in England this week. This view of the fells from Harris Park in Cockermouth gives you a feel for the raw and unsettled weather we have at the moment. Today we drove in search of Dad’s opthamology appointment to two different hospitals as he wasn’t sure which one it was in, which added a certain frisson to the proceedings, but all went well and we had a lovely drive over the fells, waved at the sea at Whitehaven, and passed the windfarms on the fells as the snow and sleet gusted around us. We returned via Thornby Moor Dairy Cheese Farm (as recommended by our friend Andrew Auld of the Loaf in Crich) where we sampled and bought some wonderful cheeses. Cheeses made with unpasteurized milk from shorthorns, delicious goat cheeses and artisan farmhouse cheeses. We admired the timeline of cheese on the shelves and then returned to Cockermouth for lunch. Edit: In view of some of your comments I will try and add a bit more here – I may not have understood this in its entirety but the cheese maker who came out to help us expalined that the rows of cheeses on the shelves were all the same cheese, the small version of the farmhouse cheese at different points between 0 – 3 months. The mould gathers on the outside of the cloth the cheese is wrapped in, which is removed before being presented for sale. The dairy produces a blue cheese but this wasn’t it. I apologise if I haven’t got this quite right. This afternoon we popped out to the New Bookshop for coffee and cake. The New Bookshop alone has sold more than 200 copies of The Cockermouth Poets, which I think is pretty impressive for a poetry anthology! Zeb has been not very well but we hope he is finally on the mend. He loves it up here usually and he has been very miserable. We love the out of hours vets who gave him pain relief on Sunday night at 10 30 pm when he couldn’t stand up without twisting and turning. Yesterday he managed to produce part of the bag that he ate 12 days ago which has somehow managed to travel through his digestive tract and re-appear as a gigantic Cuban cigar of rolled leather. So lets hope that he recovers fully. He slept in the middle of the bed last night. Now it’s time to cook supper again: roast vegetables and chicken pieces I think, and maybe sharpen the kitchen knives before I start. This entry was posted in Books, Family, Holidays, Out and About, Poodles, Skies and tagged Cockermouth, Cockermouth Poets, Cumbria, The New Bookshop, Thornby Moor Dairy on 19/03/2013 by Joanna. Where we walk a lot of the time is a piece of old woodland ten minutes away from home. I am not good at reading landscape and seeing the past and using my imagination to see what was and how it looked. I don’t usually see ghosts. This place however has a curious quality to it. It isn’t very big at all but it has steep sides and trees and the River Trym runs through from Filton to where it meets the Avon at Sea Mills. (So named as there used to be tidal mills there). It is another place worth visiting if you haven’t been there and only know Bristol as a busy city. In the middle of the woods the Trym meets an unnamed stream which comes in under the road and is often full of something nasty from somewhere higher up. This summer the Trym was almost dry and we wondered why it was so much lower than any previous year. Two evenings ago we were walking through and there were men in big helmets and yellow jackets, clambering about in the water and up the slopes and I wondered what they were doing. Fortunately I met Mark yesterday; he is the wonderful hard working park keeper who looks after the Woods on behalf of Bristol City Council – the man who knows everyone and everything that is going on. The riverbed has a leak, a large hole in its side and it’s running into the sewers. It’s going to cost lots of money to fix and it’s all a bit of a worry. It’s very unusual for a river to run into a sewer, usually it’s the other way round. When it rains heavily the river rises right up the banks and rushes along in a mad frenzy, it’s very variable. I was told a bit of the history of the river by Mark and how it has been altered over time. There is more to be read on the Friends of Badocks Wood site; how it used to be four feet deep but got filled in when some boys drowned in it and how there used to be a pond down from the weirs. Someone else told me there used to be a little tea place by the side of the rocks. There is a nice pdf here which shows you the layout of the woods, as you can see it really isn’t very big but it feels big because of the mature trees and the hill slopes and you feel a mile away from the city when in fact you are surrounded by it. 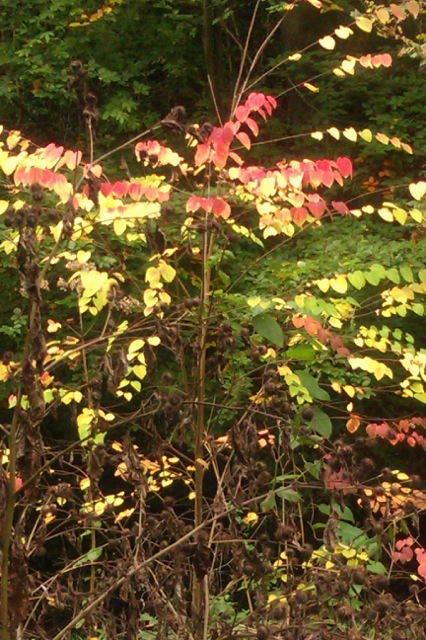 These images have been put on boards around the woods to help people orientate themselves when they are there. Dog walkers are a wonderful disparate group of people, the one thing we have in common are our animals and their needs and as we go round and about we love to share our stories and our bits of gossip. I have met people who came here as children, people who remember the Wildlife Park, now closed, people who remember shimmying up the fences round the Lake and swimming late at night when the Club was closed. In the war there were allotments on the field by Doncaster gate, then pre-fabs which were demolished in 1979. I heard about how it was almost a no-go area full of burnt-out cars at one time before we moved here and now it is a much loved and well used place. Last winter I saw the spotted woodpeckers most days and there are nearly always grey wagtails down by the stream. Wild garlic grows here in abundance in the Spring and there is lovely mixed woodland to wander through. The Council make changes and not everyone likes them, but that is always the way with spaces with different groups of users. From a dog walker’s point of view it is almost perfect. It is safe, enclosed and peaceful; there are streams to jump in and a mix of woodland and open spaces to run in off lead. Here is an experiment with WordPress’s Gallery Format, I think you should be able to see all the photos full size in a sort of carousel if you click on one of them (let me know it it works and if you like it). Photos from my phone yesterday, not an iphone, so they are a bit blurry… Zeb saw a ball in the water so decided he had to rescue it. 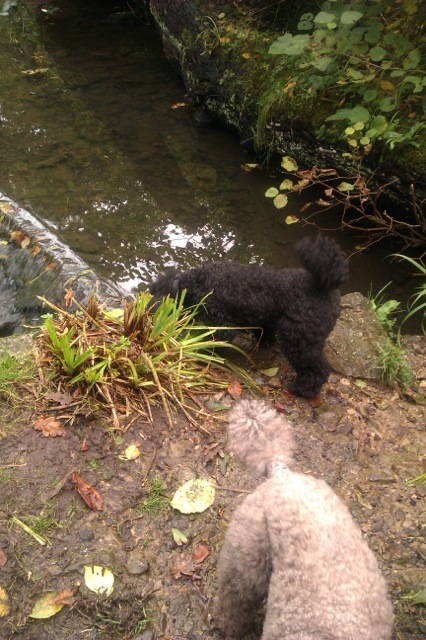 Poodles like going in water if there’s a bit of a challenge involved. I looked for photos and old maps today, I wanted to find a picture or a drawing of the rivers and the pond that Mark was talking about but I ended up getting completely distracted by these acoustic pieces by Jono Gilmurray based on recordings of the water rushing through Badock’s Wood. 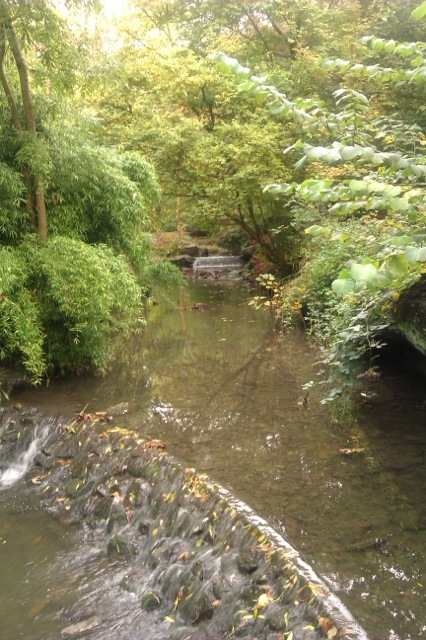 Not only dog walkers are inspired by this lovely place…. 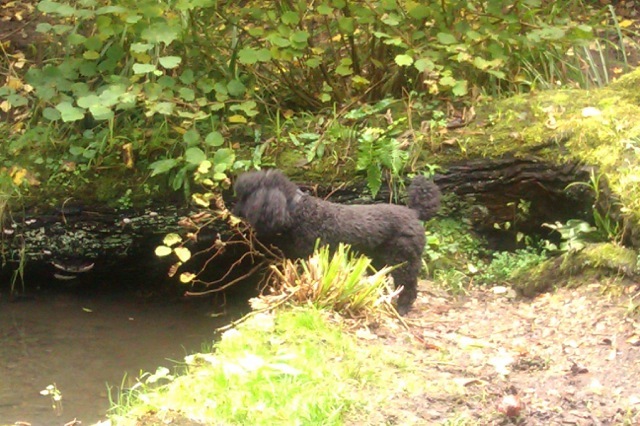 This entry was posted in Bristol, Dog Walks, Out and About, Poodles and tagged Badocks Wood, Bristol, Jono Gilmurray, River Trym on 19/10/2012 by Joanna.